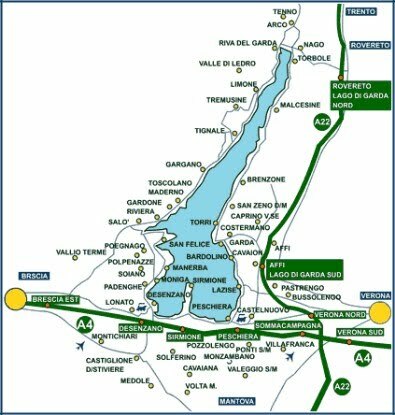 Exit in Peschiera del Garda, please follow the signs to Lazise - Bardolino - Garda. After about 15 km, arrived in Garda, at the first roundabout turn right and proceed on Via Colombo and then on Via San Bernardo for about 800 meters. After the intersection with Via Dell'Uva, please go ahead for 200 meters, You will find the entrance of the Residence on Your right. Exit in Affi, please follow the signs to Albaré - Costermano - Garda. Arrived in Costermano, at the second roundabout turn left and go to Garda. On the way You will find two micro-roundabouts, after about 300 mt from the second one please turn left (Hotel Palme on the corner) keeping the direction and proceed along Via San Bernardo for about 800 meters. After the intersection with Via Dell'Uva, please go ahead for 200 meters, You will find the entrance of the Residence on Your right.